Evom is a great free Mac app that converts video to audio tracks and lets you easily download the audio of flash movies from the web to your Mac. The interface is nice and simple, you can just drag a URL or file into the app and the video will download and convert for you, giving you local file system access to the audio of a source video. One common use for tools like this is turning interesting web videos into audio tracks and podcasts, like a conference talk for example, but you can imagine other use-cases as well. Now that’s exactly what I think is perhaps the best part about this app; you can easily download video and just save the audio track as an mp3 file, letting you play it in iTunes on a Mac or PC, or copy it over to an iPhone or iPad for listening in the Music app. This is great for the aforementioned conference talk example, an interesting video, or even something like an audio lesson that you enjoy but you can’t track it down otherwise. 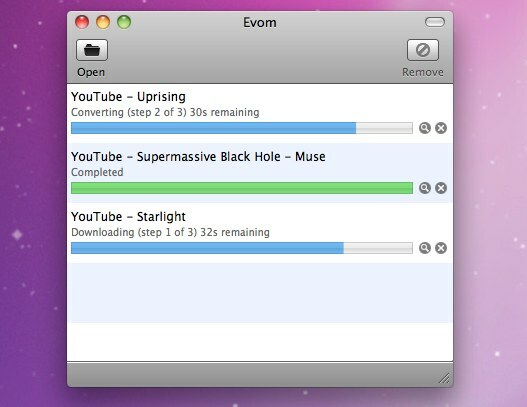 Evom will then download the video from the web, you’ll see progress bars in Evom as the app downloads and converts the source URL. Once completed, then extract and convert the audio to MP3 format and automatically import it into iTunes. With the audio track in iTunes you can transfer it to your iPhone, or just enjoy it locally on a computer. As you may have noticed the default is to import to iTunes, but there are other options available, like saving the file to a folder on the Mac instead, or converting it to YouTube or Apple TV compatible formats. You’ll obviously need an active internet connection to use tools like Evom, though once the media is localized you can listen to the audio tracks offline. 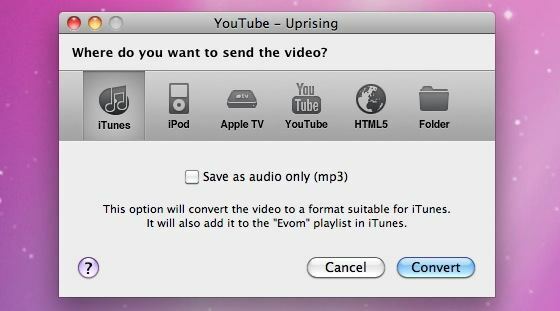 Evom is actually much more than just a way to download web videos and songs, it will convert and save most video and audio formats you throw at it as well. It’s a great app, simple to use, and free is a great price. There are other ways to achieve a similar result, for example you can download Flash videos to your Mac with just Safari, but Evom is nice because it will also convert the video file for you to a format that is compatible with iTunes, and thus your iPhone, iPad, or whatever. It’s also easier for most users to rely on a simple third party drag-and-drop app than to go with a more complex route, but feel free to use whichever approach works best for your technical proficiency level. Check it out yourself, if you’re in need of a simple tool to grab audio tracks from the web and download them to your local Mac, or perhaps copy them to an iPad or iPhone, it works quite well for that purpose. Do you know of any other interesting tools for converting web media to local audio tracks? Share your tips, suggestions, and ideas in the comments below! Nice. I’ve been using a Firefox extension to download the song, but now I don’t have to that anymore. Thanks. I download YouTube videos from the Activity menu in Safari, then extract the audio with iExtractMp3 (also free). Works like the charm! Is there anything like this that will automatically download any music that is “thumbs-uped” on Pandora, then add it to your iTunes library? this shi* is nt workin…i keep tryin to drag the url into the app..and it says that lookin 4 videos i of 1 places..or somrthin like that..and then it says no videos or url could b found…WTF.? Guys this isnt working. When I go to itunes under Evom it has a numbered name and it’s 1 min long… can anyone tell me what’s going on?